Dr. Cascya Charlot has been a long time customer of Website Physician with her website www.BrooklynAllergyDr.com, She contacted Website Physician to design and implement a content management system website for her new medical day spa located in Brooklyn, New York as well. The goal of the website was to have a professional looking day spa website allowing her full control of content changes. She also wanted to allow customers to book appointments online, view services and products available, show before and after procedure photos and interact with customers in a blog format. The result is a brand new robust content management system website that accomplishes the above and more including an area where the customer can do a self-diagnosis and submit their own testimonials. Website Physician provides monthly maintenance for their site including adding new pages, assisting in writing content, social media entries, editing forms etc. Website Physician also provides email and hosting services and search engine optimization for the site. 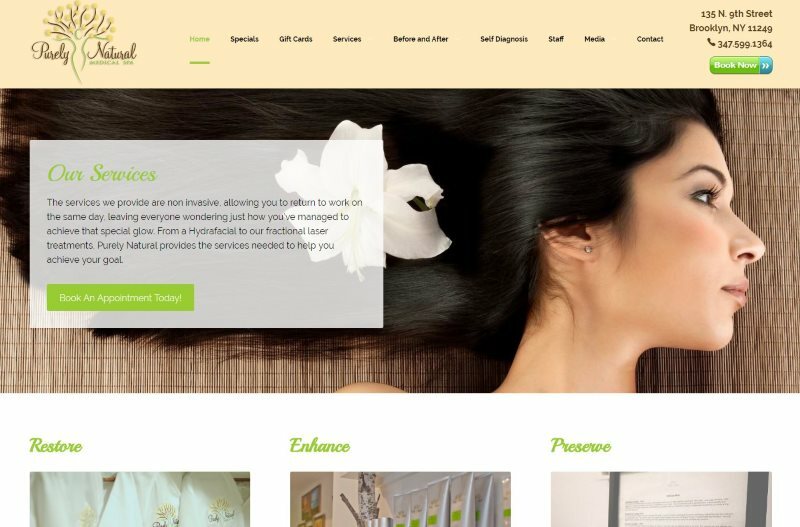 For more information about spa website design built with a content management system in which you and your staff can have full control of with no reoccurring expenses, please contact us at 513-759-4932 or simply fill out our online contact form for a free quote. Click here to view the full Purely Natural Spa website.